Some services are running at a major London railway hub after a test train severely damaged overhead electric wires. 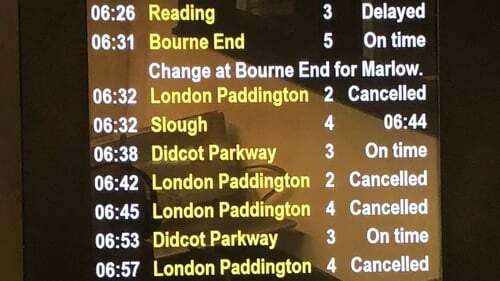 London Paddington was almost deserted during the morning rush-hour as commuters were told many key routes would be suspended for much of the day. Trains were unable to run between the station and Slough or Heathrow Airport after 500 metres of overhead power cables suffered "extensive damage" at Ealing last night. At around 12.40pm, Great Western Railway (GWR) tweeted: "Following overhead line damage some lines have reopened and a reduced service is operating into and out of London Paddington. "Please expect delays for the rest of the day. We advise only to travel if necessary." A GWR spokesman said the damage was caused by a Hitachi test train running from London to Bristol depot at around 10pm yesterday. Many trains became stranded between Paddington and Reading due to a loss of power supply and GWR said a reduced timetable would impact most mainline routes. Travellers trying to get to Heathrow were told to take the much slower Piccadilly Tube line to the airport or a bus replacement service. Delays on the Central, Circle, District, Hammersmith and City, Jubilee and Metropolitan London Underground lines compounded difficulties for commuters trying to get across the city after arriving at alternative rail hubs. GWR staff wheeled a trolley on to the Paddington concourse at around 8.30am to give away free tea, coffee and biscuits to frustrated commuters. A spokeswoman said: "We are experiencing severe disruption on all services into and out of London Paddington and this is likely to affect services in other areas for the rest of the day. "This is owing to 500 metres of extensive damage caused to overhead power lines in the Hanwell area yesterday evening. "We have been working throughout the night to understand the extent of the damage and we are focusing on trying to open some lines into London Paddington as soon as possible." Elsewhere, travellers trying to get from Slough to Windsor and trying to catch a train to Waterloo instead of Paddington, as advised, faced a further 35-minute delay at one point because there was no driver available for the short journey. It followed an evening of major delays as electricity supply problems caused delays and cancellations on a number of busy routes in and out of London. Southern, Southeastern, Thameslink and Gatwick Express were all reporting cancellations and delays of up to 45 minutes.